Business cards in any profession are one of the most powerful marketing pieces you can have. They can often be the gateway to that all-important callback from a client. 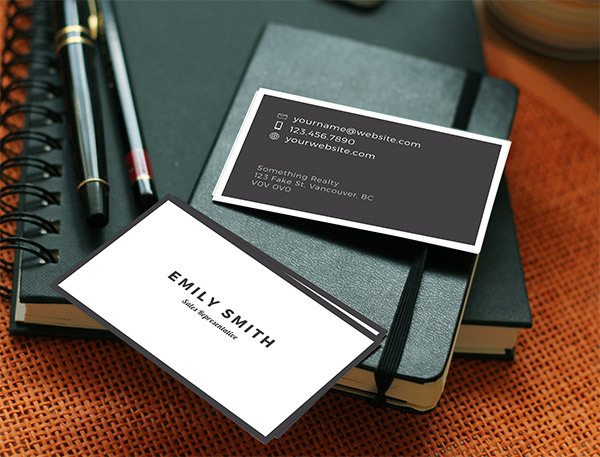 The key to a good business card design is to make sure that your contact info is easy to read, quickly found, yet beautiful and eye-catching. At RealtyNinja we want to give you options other than your standard brokerage card design. You should stand out and be recognized amongst your peers! That’s why we’re taking the time to design a series of free customizable design files for REALTORS® to download, modify and send to your favourite printshop. If you just need something to hand out until you solidify your brand, or even if you don’t want a whole brand package and just need to get your name out there in a stylish way, this is for you! The first freebie we are releasing in this series is for the REALTORS® specializing in luxury homes. We designed it with a super-simple layout, clean, strong lines and elegant typography – you’ll be proud to hand these out at your next open house! In order to receive your free luxury real estate business card designs, simply subscribe to The Dojo mailing list using the form below. Your files will automatically be sent to your inbox upon confirmation! Note: Please allow up to 5 minutes for your file to arrive.